SG-1's robot duplicates from Altair arrive on Juna, only to find that SG-1 had preceded them there, and the inhabitants have mistaken them for their human counterparts. Earlier, SG-1 had helped the people of Juna to overthrow Heru'ur, but now Cronus has arrived in his ship and claimed the planet instead. 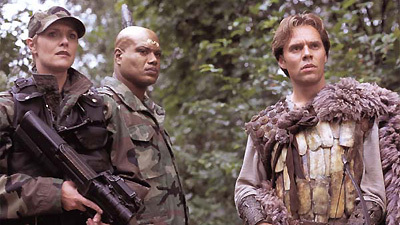 The duplicate Carter, Daniel, and Teal'c are captured, and Daniel is destroyed, revealing to the astonished Goa'uld that the team is not human. O'Neill hopes to rescue his team, but he finds little support from the people of Juna who are unwilling to face another rebellion. Meanwhile, Harlan of Altair arrives at the SGC, pleading for SG-1's help. The duplicate team, he explains, has been going on missions, however they are long overdue from their mission to Juna, and are dangerously near the limit of their portable power packs. SG-1 feels a sense of responsibility toward the people of Juna whom they had once liberated, only to be conquered again, and so they reluctantly agree to return to the planet in order to face the forces of Cronus and set things right once more. On Juna, SG-1 meets up with the duplicate O'Neill, who is also in contact with his team members being held prisoner by Cronus. Together, the two teams orchestrate an elaborate plan to defeat the Goa'uld forces. As the duplicate O'Neill and Carter provide cover, and Teal'c faces Cronus, each of the robot doubles gives his life in the deadly battle, but it is through their sacrifice that SG-1 succeeds in killing Cronus, capturing his pyramid ship, and freeing the planet once again. SG-1 had led a rebellion on Juna against the forces of Heru'ur. The Juna were told to bury their gate, but Cronus came in his ship and claimed the planet as his own. The duplicates of SG-1 had not been content to remain on Altair. Carter created a portable power pack worn in the chest which lasts 48 hours before needing to be recharged. They also have internal communication radios. The duplicates continued to go through the gate on missions as a team. Daniel was on an off-world mission.